The story of a man of courage. Set in Norway in 1883, Henrik Ibsen's classic drama about greed and bigotry, An Enemy of the People, is here given contemporary significance in a version scripted by the celebrated American dramatist Arthur Miller and starring Steve McQueen. McQueen plays Thomas Stockman, a respected doctor in a small Norwegian spa who discovers that the village's water supply has been polluted by effluent from a nearby tannery. Passing on the information to the mayor - who also happens to be his brother - Stockman is shocked to learn that nothing is to be done about it in case the bad publicity such a revelation will undoubtedly unleash ruins the village's much relied-upon tourist trade. In the end Stockman finds that he is alone in wanting the truth made public, his conscience in the matter leaving him little choice but to sacrifice both his career and his family for his beliefs. 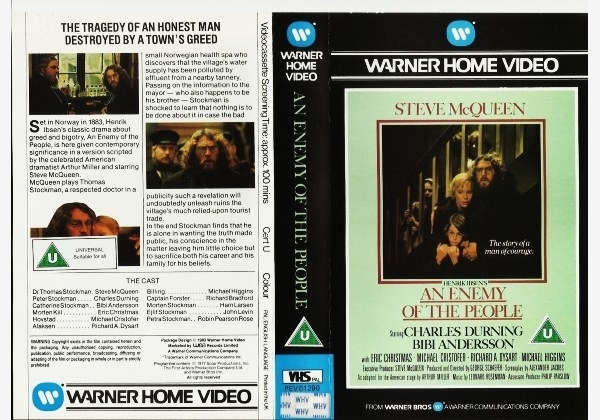 Or find "Enemy Of The People, An" on VHS and DVD / BluRay at Amazon.